The Employee Retirement Income Security Act (ERISA) protects the interests of employee benefit plan participants by requiring employers to provide accurate plan information to their employees, establishing conduct standards, and ensuring employees receive their benefits even if their employer goes bankrupt. Passed in 1974, ERISA is instrumental in protecting retirement savings from mismanagement and other types of fraud. It also protects health and disability insurance, pension plans, and employee stock ownership plans, mandating transparency and accountability. Under ERISA, employers owe a fiduciary duty to their employees, which requires them to make the most prudent investments decisions when managing this type of funds, including 401(k) plans. The fiduciary duty imposed on employers is one of the highest standards recognized under U.S. law. Workers have important legal rights and can sue hen an employer or third party plan administrator violates its fiduciary duty. ERISA fraud can take many forms. Below are some of the ways employers and administrators commonly breach their ERISA-protected fiduciary duty to employees. ● Make plan asset-related decisions that benefit plan administrators, plan sponsors, etc. Our ERISA fraud attorneys have a track record of protecting employees’ rights and holding fraudsters accountable. We are prepared to take on this type of cases nationwide. It is a common practice to invest pension plans or 401(k) funds in the employer’s stock. When this is not in the best interest of the plan participant, a breach of the company’s fiduciary duty occurs. For example, stocks are often purchased at above-market value. There have been many prominent cases of ‘reverse 401(k) embezzlement’ in the U.S. Infamous fraudster ENRON, for instance, not only committed massive accounting fraud, it also drained its employee retirement plans. In 2014, a former defense contractor was sentenced to three years in prison after stealing over $186,000 from an employee 401(k) plan. In February 2018, a company called U.S. Fiduciary Services paid millions of dollars to resolve allegations that 42 retirement plans it managed suffered $16 million in losses as a result of fraudulent investments in fictitious loans. In 2017, General Electric was sued for managing its employees’ 401(k) for its own gain by loading it with mutual funds which were owned by none other than its own subsidiary. Charging steep fees and underperforming, the investments caused workers to lose millions of dollars in potential gains. Fund administrators, large corporations, mid-size companies, and corporate CEOs have all been found to have ‘reverse embezzled’ monies from employee benefits plans. If you suspect your employers may be stealing assets from your retirement, call us immediately. Our ERISA fraud lawyers will help you determine if you have a case, how to stop the fraud from continuing and how to get back your hard earned money. 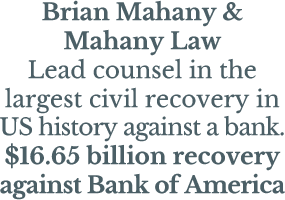 For more information, contact attorney Brian Mahany online, by email [hidden email] or by phone (877) 858-8018. The call is free and confidential. If the employer keeps switching managers for 401(k) accounts or they often quit for no apparent reason, this can be an indication of foul play. If it starts getting difficult for employees to get money from their 401(k) after they retire, this may mean that some of the funds are simply no longer there. If you receive plan statements late or erratically, this may also indicate your employer is using plan assets in improper and illegal ways. While it is not uncommon for employers to make contributions to retirement accounts a few days late, any delays over a month or ever increasing delays may be cause for concern. If your account balance does not make sense in the light of market performance, your employer may be misusing funds from the account. The majority of 401(k) plans require participants to authorize investments. If you notice your funds are being invested in ways you have not authorized, this is a breach of your employer’s fiduciary duty. That is the case when your employer is borrowing money from the plan. Fraud does not only occur when employers and administrators conspire to charge excessive fees or steal from retirement plan participants. Sometimes, they are simply lazy or negligent. In late 2017, a complaint filed in Colorado revealed that 20 participants in a retirement fund managed by Great-West Financial lost over $2 million combined as a result of a cyber attack. By providing accurate participant data, fraudsters were able to successfully withdraw funds from the compromised accounts. Thus, cyber-security failures can also put your retirement account at risk. Because both employers and retirement plan administrators have a fiduciary duty to plan participants under ERISA, an experienced attorney can find a way to recover money lost due to cyber attacks. On the other hand, whether the employer is receiving kickbacks or not, if the plan administrators charge excessive fees or make investments for their own gain, there is a breach of both the fiduciary duty of administrators and that of administrators, because they are both responsible for investing benefit plan assets with your best interest at heart. Lucky for the many courageous whistleblowers out there, ERISA has whistleblower protections, including anti-retaliation provisions. This means that if you come forward with information about ERISA fraud, you are protected from retaliatory termination and other similar practices. Under ERISA’s anti-retaliation protections, employees are protected from being fired before they can qualify for certain benefits. It is also “unlawful” to “discharge, fire, suspend, expel, or discriminate” against anyone who has informed or testified in any investigation or legal proceeding relating to ERISA. As a rule, in order to be eligible for these whistleblower protections, the employee in question must report the fraud externally, rather than simply telling a supervisor or contacting the company’s HR department. But some courts disagree on that point. Therefore, the best course of action if you have information about fraud is to contact an experienced ERISA whistleblower attorney. Blowing the whistle about ERISA fraud is a noble endeavor. By protecting those hard-earned employee benefits, you are doing a valuable service to all the workers in the company and helping deter would-be fraudsters from committing future crimes. The majority of employee benefit programs in the U.S. are covered by ERISA. Government pensions, however, are not. In spite of this, our employee benefits fraud lawyers can help victims of government pension fund theft and related violations. From Racketeer Influenced and Corrupt Organizations Act (RICO) cases to class actions, we have filed lawsuits under a variety of laws. All you need to know is that no matter what industry you are in or what your situation is, if your retirement plan has suffered losses due to foul play, we can help you recover lost monies and hold the culprits accountable. Fraudsters who reverse embezzle money from employee benefit plans often defraud a large number of accounts out of a small amount of money. Thus, it is not easy to file ERISA fraud cases on behalf of a single victim, whose losses may amount to merely a couple of hundred dollars. But when administrators overcharge fees or CEOs ‘borrow’ from 401(k)’s, there are always scores of victims that can make the case much more solid. In order for a class action to proceed, a judge must first certify that the cases of all the plaintiffs involved are similar enough to be treated as a class. Our ERISA fraud and employee benefits team has the resources and experience to protect your hard-earned benefits. If you have been a victim of 401(k) theft, fraud, or mismanagement, we can help. We are prepared to accept most ERISA fraud cases on a contingent basis; this means that we will not get paid unless your case is successful. Contact us for a thorough and confidential consultation today. If you suspect your employers may be stealing assets from your pension fund, you cannot waste time, or your account may soon be depleted. Our ERISA fraud lawyers will inform you about how you can take advantage of whistleblower retaliation protections and ensure that the misconduct stops as soon as possible. Internal reporting is not enough, as this may expose you to retaliation. Contact us today to stop wrongdoing and achieve the financial security you have earned to enjoy your golden years. For more information, contact attorney Brian Mahany online, by email [hidden email] or by phone (877) 858-8018. The call is free and confidential.